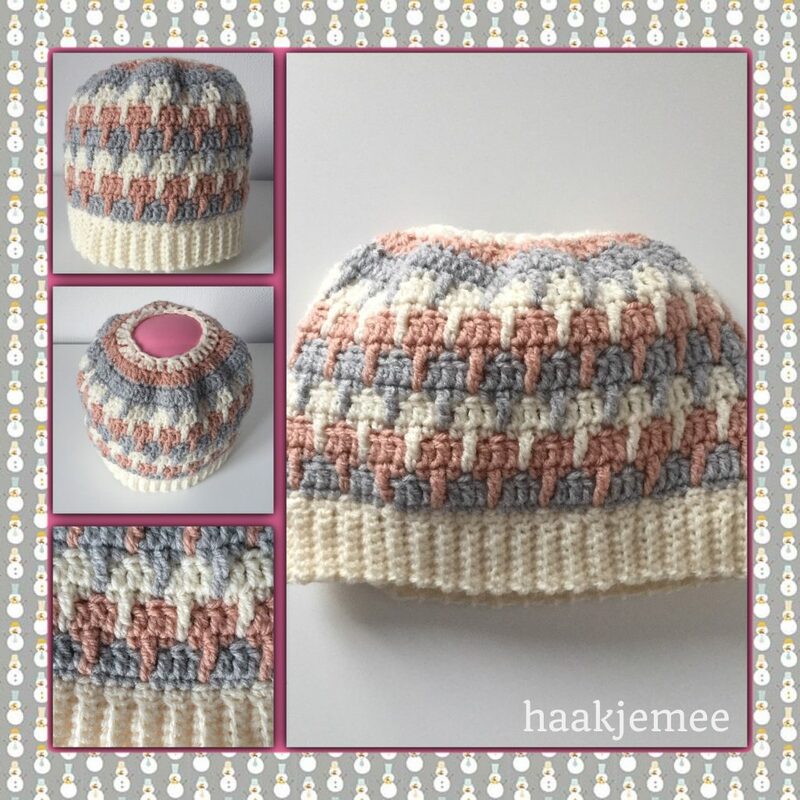 I liked creating the Dutch messy bun beanie and soon I had another beanie in mind. So here it is: the three-color messy bun beanie crochet pattern! If you like (bun) beanies, check these out! I made video tutorials for this hat. Please turn on the subtitles if you watch them. They explain what I’m doing. Use white yarn and chain 9. 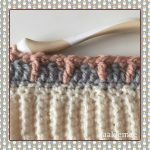 Crochet in the back loops only: ch 1, sc in each st (8) Turn. Note: if you believe your brim is long enough for the required size, you can stop. Make sure you can divide your number of stitches by 4. Fold the sides together and join them with 8 sc. Turn the brim around so the seem is on the inside. Don’t cut the yarn, but continue. *sc in next 3 st; ch1 and sk next st; repeat from * around to last st, sc in last st; close with sl st and ch 3.
dc in next st; ch1 and sk next st; *dc in next 3 st; ch 1 and skip next st; repeat from * around to last st, dc in last st; change to pink and close with sl st. Leave the grey yarn hanging, so you can pick it up again later. *sc in next st; ch1 and sk next st; sc in next st; trc in space below; repeat from * around until the last st, sc in the last st; close with sl st.
Use a sl st to go to the next st.
*dc in next 3 st; ch 1 and sk next st; repeat from * around; change to white color and close with a sl st.
Don’t cut the pink color, but leave it hanging so you can pick it up again later. *dc in next 3 st; ch1 and skip next st; repeat from * around and close with a sl st.
Change color to pink. Repeat round 6 and 7. Change color to white. Repeat round 8 and round 9. (Sc in the next 3 stitches – 1 trc in the skipped stitch of previous round) all around. Fasten off and weave in the ends. Enjoy your new messy bun beanie! Hi Rebecca, this means 1 dc in each stitch. Thanks for your question. I just changed the notation and I hope it’s easier to read the pattern now. What yarn did you use? The pink looks a bit orange in the photos, so it would be helpful to know the exact brand and color numbers you used. Very nice pattern. Thanks for this cute pattern. It was fun to make. Yes, I did use them to start a row. I’m so sorry to hear that. I’m Dutch and tried my best to translate it into English. Could you help me by explaining what part is hard to follow? That way I can improve the pattern and help people understand it. Thank you. I find 84 rows makes the hat to big. 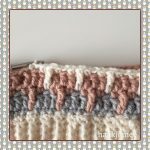 How many rows can I take off to still make the pattern work? I don’t want to tear it all out and start with a smaller hook. The number of stitches has to be dividable by 4. I hope this helps you to adjust the brimsize. Thank you so much for your comment! It’s nice to hear you enjoy the pattern. Thanks for the compliment about how it’s written, I really appreciate that. Help! I can’t get the round 4 – with the triple in the skipped stitch to work. I am confused and it does not work. Help! I found that it was easy to follow. 🙂 and i really like the pattern. Hello, nice to hear the pattern is easy to follow. Thank you! I do crochet quite tight. You could make the brim shorter if you like. As long as you can divide the stitches by four. Hi – what size hook are you using for the pattern? I didn’t see it in the instructions. It’s nice to hear you’re excited about this pattern! I used the 5 mm hook size. 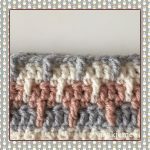 I made your pattern and I love it!!!. Your directions were so easy to follow and so thorough!! I’ll definitely be making more! Thx so much and God bless!!! Thank you for those pattern. I do agree that there are some flaws in the pattern though. I think if the person making it has some experience you can get past the parts that are left out. There is no instruction on how to connect each row and then begin each new row. I also had a question about the hook size. I used a 5mm and it is huge! My 5mm is also an HTC. Is that different for you? I really do love the hat and will try again, I’m just not sure if I should change the amount of stitches or change the size of hook. Any suggestions? Hello Kelly, thank you for your feedback. I used a 5 mm hook, that should be a H indeed. That worked well for me with the worsted weight yarn I used. 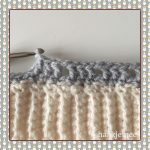 In the beginning of the pattern I mentioned that each round is closed with a slip stitch in the first stitch of that round. I didn’t mention how to start each round, I did in the video tutorial. But of course I could put it in the written pattern. If the brim is to big, you could choose another amount of stitches, as long as they are dividable by four. My 5mm is an H. (Not HTC) oops! Thank you for your help. I didn’t think to watch the tutorials! I will try using less rows on the band. Thank you again for the pattern! In the video I also show how to begin a row with ch1 or ch3. That part is written in the beginning of the pattern, but not in every row. So it may seem different, but the video shows what you have to do in the rows. 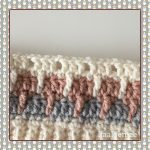 Thank you for posting this beautiful pattern! I loved it! I agree that this is very confusing. For example, in your written pattern for Round 2 of the hat you say to do 2 SC, skip next stitch Ch 1, 1 SC all around. However, in the video you do a SC in 3 stitches, then Ch 1 and skip a stitch and then start that again. If someone who has been able to figure this pattern out that is English speaking could re-write this pattern so that it makes sense it would be great! Thank you for your comment! I rewrote the pattern, so it matches the video tutorials. I also used a different way of writing it down and hope that’s helpful. Hello my fellow crocheters! I rewrote the pattern so it matches the video tutorials. There are no changes in the pattern. I really hope it’s not so confusing anymore. I used a way of writing that I found in an English crochet book. I also noted that you can make the brim shorter if you like. Just make sure you can divide the number of stitches by four. Thank you all for your feedback, it’s nice you’re trying to help. I appreciate the effort and wish you a lot of fun making this bun beanie! Just starting ….but I really like the look of the hat. Thank you for the pictures…..that helps. I am trying white, red and green for a Christmas gift. I just want to thank you so much for the tremendous effort you put in translating this to English for all of us! It was nice enough of you to share your beautiful pattern, but to take so much extra time to translate, and then rework it again to match English crochet books is amazing. How generous of you – and it is very much appreciated!!!! I loved the hat. I made it for my daughter for Christmas. I loved the stitching so much, I made some fingerless gloves to match.